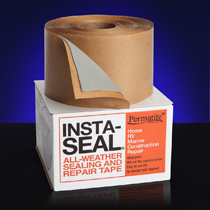 Insta-Seal is a multipurpose cross linked butyl rubber tape that provides the ultimate in weatherproofing. It bonds to galvanized metals, aluminum, stainless steel, plastics, wood, glass and concrete. *Halar is a registered trademark of Solvay Soliexis, Inc.